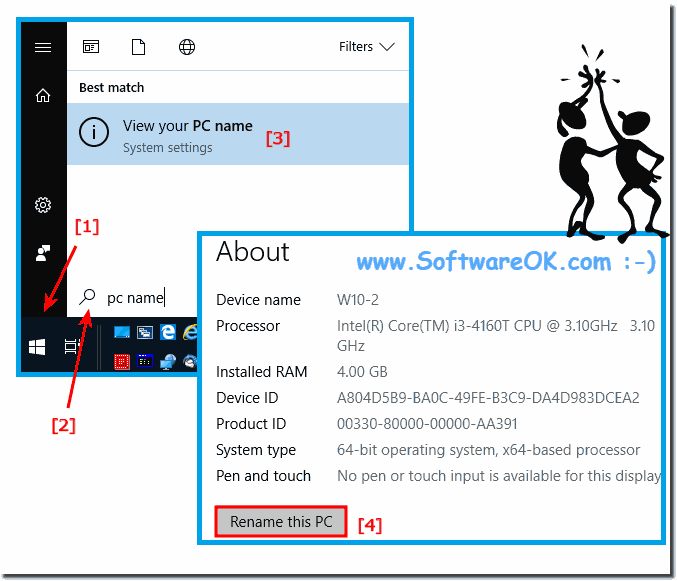 Here is the solution how to change the computer name under Windows 10 quickly and easily or workgroup if needed! It is possible in Windows 10 without much effort to change the host name or rather the computer name on the Windows 10 operating system via advanced system settings in Windows 10. 1.) ... Easy change computer name and workgroup! 2.) ... About Windows-10 computer names in a network! 3.) ... Change the computer name on Microsoft Surface Pro / Tablet Mode! 4.) ... What should I consider when assigning computer names? 1.) 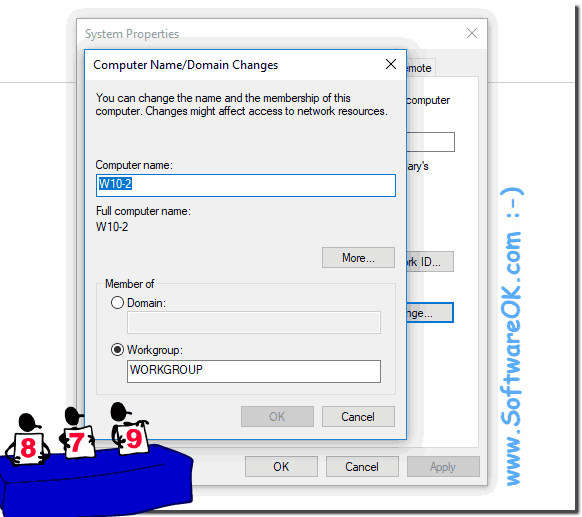 Easy change computer name and workgroup! Please start the advanced system settings in Windows 10. The quickest way is via Run in Windows 10, open this keyboard shortcut Windows logo key + R.
In Windows 10 Run just type the command sysdm.cpl! When you set up (install) Windows 10, Windows 10 automatically creates a workgroup and gives it a name. You can join an existing workgroup or domain on a network or create a new workgroup. (Image-1) Computer name and working group on Windows 10! 2.) Worth Knowing About Windows 10 Computer Names in a Network! The Windows 10 computer on a network should have unique PC names so that computers can recognize each other on the network, To communicate with each other Computer. To avoid problems with older Windows operating systems, it is recommended to use only standard character characters (0-9, AZ and hyphens). (Living Room PC1, Office PC1). Computer names should not just be numbers. See also: ► Activate in Windows-10 the IIS web server! (Image-2) The computer name on Windows 10! Windows 10 Workgroups provide a basis for file and printer sharing, but do not actually set up sharing for you. In contrast, in Windows 10 you can create or join a homegroup, which automatically turns on file and printer sharing on home networks. If you have a home network, creating or joining a homegroup. If your Windows 10 PC was a member of a domain before you joined the workgroup, it will be removed from the domain and your win 10 computer account on that domain will be disabled. If your network includes computers running Windows XP, you might need to change the workgroup name on those computers to match the workgroup name on the computers running on Windows 10 or Windows Vista so that you can see and connect to all computers on your network. 3.) Change the computer name on Microsoft Surface Pro / Tablet Mode! Because with the virtual keyboard with keyboard shortcuts harder on Microsoft Surface and other Windows 10 Tablet PC in tablet mode when working without a real keyboard. 1. Open the settings via the "Windows logo button" and type "pc name" ! 2. Tap on "View your PC name"
3. In Right panel scroll to point About and just "Rename this PC"
(Image-3) The computer name on Surface and Windows 10! 4.) What should I consider when assigning computer names? Duplicate computer names cause to problems in the network especially when assigning the IP address, for example on the Router, this can lead to conflicts! It is also absolutely safe to change the computer name after installation and even with pre-installed programs, here is the query usually at the start of each program. The name of the computer with the name Windows-10 is not so good, better is Win10-PC1, Win10-PC2, Win10-PC3! Windows-10 - FAQ-17: The computer name and working group in Windows 10, is it possible to change the name?